Ford Is GWCA’s Sponsored Star for December! As our Sponsored Star, Ford has a $2,000 grant available towards his adoption fees! 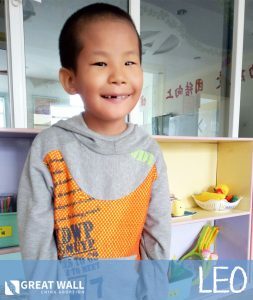 If you are interested in seeing Ford’s file or learning how you can be matched with him, visit our China Waiting Child Photo Listing or contact our China Matching Team today! Ford is a precious little boy from China that just turned 1 year old. Ford has mild CHD (ASD) and was born with syphilis and Hep C. His syphilis has been treated and is no longer an issue and he is on medication for his Hep C and it does not affect his everyday life. One of our GWCA staff members met Ford when she visited China earlier this year and she would be happy to speak with any interested family about Ford! Ford can crawl, stand up by himself and is learning to walk. He can grasp toys near him, can take blocks and put them in and out of cups, and he can go look for toys when he drops them. He knows his name and turns to look when called, he responds to his caretakers asking him for objects, he babbling and saying some words like “ma ma” and “go.” Ford can take his socks on and off by himself. He will point to the correct parts of his face when asked “Where are your eyes?” or “Where is your nose?” He is fond of listening to music and likes to laugh when teased by his caregivers. Below is a video that a GWCA staff member took of Ford when he was just 5 months old!You can contact the China Home Finding Team at Great Wall if you would like to see Ford’s other videos or learn more about adopting him. We hope we are able to find Ford his Forever Family soon! On the 1st of each month, Great Wall China Adoption will feature one of the kiddos from our Orphanage Partnerships as our monthly “Sponsored Star!” As our Sponsored Star, that child will be provided a $2,000 grant towards their adoption fees! Each of the kiddos selected will be a Special Focus child, meaning they have not found their Forever Family yet due to their age, or the degree of their needs. Together, we can find loving homes for these amazing kids! 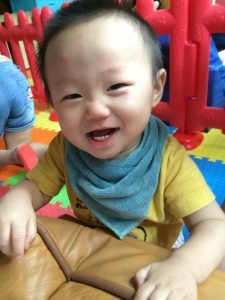 We encourage any families interested in learning more about our Sponsored Star of the Month to visit our China Waiting Child Photo Listing, or contact our China Matching Specialists to learn how you can be matched today! Check back on the first of each month to meet the newest featured child!